Whether gradual or sudden, the loss of a beloved dream, person or ideal is painful. Have you ever looked at loss as a gift; a beautiful part of life? Often you start grieving your loss even before it occurs. 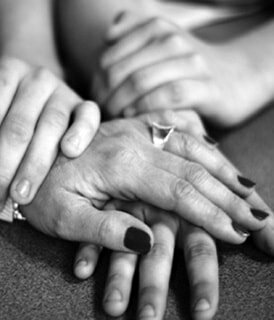 The gift of gradual loss is that you have the opportunity to grasp the grieving process. As you enter slowly into the various stages that come with grief, through growth and acceptance, you can learn and begin to let go before the finality of loss has occurred. There is no right way to lose a dream, let go of a loved one, or to grieve the loss of your ideal not realized. When sudden loss happens you are often catapulted into the grieving process, it’s more of a shock…Whatever way you have entered into the grieving process, there is no way out but through. So, I invite you on this journey through the stages. All feelings in life are a blessing, because we are alive to feel them. Click below to watch the Understanding Grief Video and start your healing process now.. I want to thank you for sharing this very powerful and emotional video with me. I was able to watch it a few times and with your permission would love to share it with a friend. I really appreciate and found it useful. Looking forward to our appt. Often we are not aware of the impact our grief has on our families, friends, work and our own life. Our loss triggers old coping mechanisms from our family system. A deep longing for intimacy and unconditional love is stirred inside of us. When this intimacy is missing, due to loss, we can experience many symptoms, including: loneliness, a feeling of emptiness, sadness, depression and irritability.﻿ We can be absent minded, unfocused, confused or overwhelmed, and truly not ourselves. I have had the personal opportunity to work with hospice for over nine years helping families to stay intimate through the dying process, through intentional communication, breath and touch. On a personal level I lost a brother and niece to suicide/addiction and lost my 71 year old mother to inflammatory breast cancer. Grief, loss, hospice care and the impact it has on families financially, additional time constraints, emotionally, spiritually and mentally is something I am well aware of both personally and professionally. Getting help helps others. Let us make an impact together, there is strength in numbers. Talking about, getting support and shedding light on a very heavy topic not only helps you, but it helps and impacts the world around you to better understand and support those of us grieving. I have created this video in dedication to my brother Levi Hans (transcended us at age 32). The Automatic Path to get through your grieving process and start feeling good again. How to make your grieving phase an endearing process that you share with others, so healing occurs. The 5 Steps of Grief, so that you know exactly where you are in your experience of loss, which allows you to grasp a better understanding and feeling of manageability as you move through this process. The #1 mistake that is a catalyst for disregarding your own feelings and getting trapped in your grief without even knowing it. Impacting those around you. Simple, powerful and effective secrets for healing that invigorate new life and happiness again. The companionship and connection of grieving empathetically with others that walked through the same process. Discover how to release and reveal your true emotions; how to navigate through your own personal grieving process and not imprison your emotional process. How to hold good boundaries with others, manage your self-care and create much needed space for yourself. A gentle unfolding while having permission to be exactly where you are at and a safe understanding, compassionate place in which to experience it. Please reach out to me directly at Heidi Love 415-887-9746 and schedule your grief recovery session. Sessions are offered nationwide via video conference. Of Course if you are in my area, you are welcome to see me in person. Following a loss, you may experience a variety of physical reactions to grief. These are a normal part of the grieving process and each person’s reactions will be individual and unique (i.e., they will vary in duration and intensity). However, if these reactions become severe and interfere with your ability to function on a daily basis, you may need more support. Read the symptoms below and if you are experiencing some of these and you want to heal through them, I invite you to schedule a grief recovery session to work through your individual process with a professional. Shortness of breath, headaches, nausea, changes in appetite, loss or extreme increase in appetite, insomnia and fatigue. Intense grief also compromises the immune system, so you may get sick more often and for longer periods of time. Shock and disbelief are natural reactions to the news of a loss. Denying loss is a coping mechanism that allows you to get through the first few days of grief and your body's natural way of protecting you. Denial (and the resulting numbness) may help you process what has happened and accept the reality of the loss. Most people expect to feel sad immediately after loss or the acceptence of an unwanted reality. But sadness may come later as time goes on, especially once you resume your daily routine. It often happens at the most inopportune times. Extreme grief may cause a chemical change in your body that can lead to depression. If you recognize any of the following warning signs, especially if you have been suffering for an extended period of time— I encourage you to consult a doctor or a mental health professional and or a holistic practitioner for support. • Inattention to personal hygiene/appearance, etc. This is one of the most common symptoms of grief. You may seem more confused than usual, may become forgetful or easily distracted. Guilt is a common reaction to grief, often making you feel like you could have made things better or done something to keep your loss from happening. You may also feel guilty if you feel there is something you could have done to prevent the loss. If this is the case, remind yourself that loss is out of our control and is part of the same coin as love. Love and grief are opposite sides of the human heart, but one in the same. You may feel a sense of hopelessness and feel that your current state (physical, mental, social or spiritual) is beyond repair. These feelings generally dissipate over time. You will gradually develop a sense of hope as you begin to experience life again. You will have good portions throughout the day, then eventually entire good days. There will undoubtedly be rough times along the way (especially birthdays, anniversaries, holidays, etc. ), but it’s important that you remain focused on the good times ahead!